Moulak Misr (Owners of Egypt), Edited by: Mohamed Gad (Cairo: Dar Al-Maraya), 2019. 343pp. Dar Al-Maraya has published a new book that tackles the last four decades of the Egyptian economy with an emphasis on politics determined the outline of economic policies in this period. 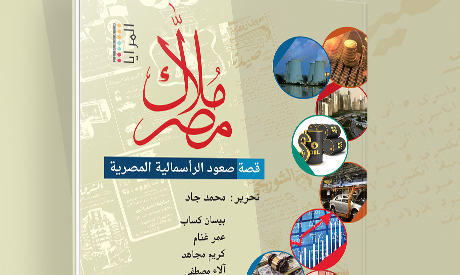 Entitled Moulak Misr (Owners of Egypt), and edited by Mohamed Gad, the book brings politics back into the analysis of economics, and vice versa. The main premise of the book is that since Samia Imam's Who Owns Egypt was published in 1985, all books on Egypt's economics sought to present themselves as politics-free, based on a neoliberal stance and analysis grounded on claims to objectivity, which not only served neoliberal policies but also failed to elucidate the political context that produced these policies. Through its seven chapters, the book explores the dynamics of the Egyptian economy from the 1970's until now, and seeks to understand who is using who. It tracks the process by which the state extracted itself out of economic activity, leaving the stage to the private sector. The book also discusses the emergence of the phenomenon of private housing compounds in Egypt, which is an important social phenomenon and was a tool for the accumulation of capital. The book offers data and charts to support its studies. In the first chapter, Bissan Kassab, explores the commodification of housing. Mohamed Gad writes about the food industry and the business of creating hunger in the second chapter. The third chapter, by Omar Ghannam, tackles the issue of privatising the engineering industries. The fourth chapter, by Kareem Mougahed, is about the textile industry in Egypt. The fifth chapter, by Alaa Mostafa, concerns the communications sector. In chapter six, Abdel-Hamid Mekkawy discusses the political economy of the petroleum industry in Egypt. The seventh and last chapter, by Osama Diab, offers a look at the financial sector as a tool for wealth concentration.